Making Gems for Cosplay « Adafruit Industries – Makers, hackers, artists, designers and engineers! 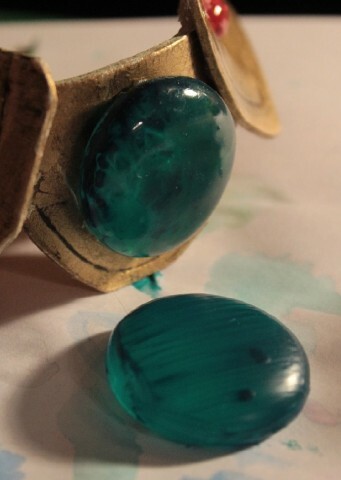 If you need to make gems to insert into armor or props for cosplay, you can choose from several materials to create them. 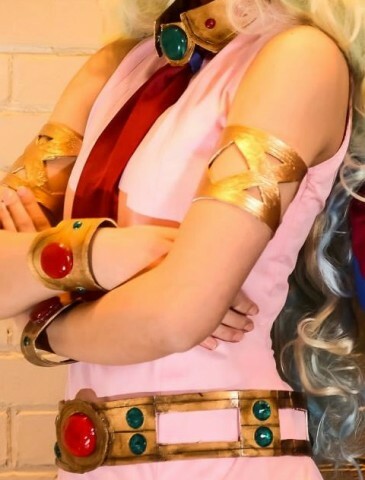 Lissa, also known as Periodically Papaya Cosplay, had to make some for her Nia Tepplin costume. Though you can pour your own gems from resin or even sculpt them, she opted to paint clear stones. You can find clear stone and gems in the floral supply section of any craft store. They’re usually called decorative fillers. The stones are often available in different sizes, and if you can’t find the right stones, check the jewelry and sewing sections for faux gem stickers. They’re the kind you’d use when making jewelry (obviously) or bedazzling something. Lissa used watercolor paints to add pigment to the stones. She applied a thick layer of watercolor paint with a lot of water to the top surface of the gem/stone (not the back) and let it dry. Then she applied a second layer to ensure complete coverage. Once the gem dried, she sprayed on a glossy sealer – one of the brands Mod Podge offers. Once it’s dry (and that might take a full day), it’s ready to be applied to armor, tiaras, weaponry – you name it. More pictures and information at Lissa’s Tumblr.